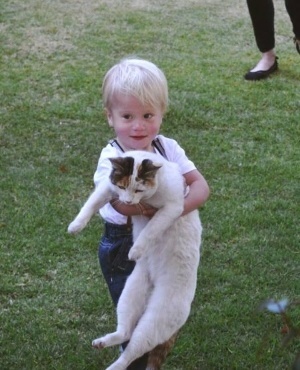 Liam Nortjé from Harrismith in the Free State turned four last week – but it’s unknown whether he’s even still alive. This is the second birthday of Liam’s his family has had to celebrate not knowing where the little blond boy is. He would’ve turned four on Thursday 21 March. There was no birthday cake or balloons on the day. “It’s been two birthdays, two Christmases. His birthday was last Thursday, on the public holiday,” says Liam’s eldest sister, Wynette (20). Wynette says she has no contact with their father, in whose care Liam was when he vanished a year and four months ago. She has no desire to see him either. Nantes Nortjé, Liam’s father, remains in custody under suspicion of abduction. Sergeant Mmako Mophiring, police spokesman in the Eastern Free State, confirmed to YOU that the high court date for the trial hasn’t been set yet. The charges against Nantes have also not been finalised. There’s a “strong suspicion” little Liam was murdered on the day of his abduction, November 21 2017, more than one independent source has told YOU. Apart from the abduction charge, Nantes might also be charged with murder or attempted murder. Nantes, who’d been in custody in the Harrismith prison this whole time, has yet to say a word about the whereabouts of his son. Liam is his son with his estranged wife, Cheinelle (43). YOU previously reported that prior to Liam’s disappearance Cheinelle had told Nantes she wanted a divorce. She suspects he’d abducted Liam to punish her. Wynette, the eldest of Nantes’ three children, says it’s heartbreaking to live with the uncertainty, especially on Liam’s birthday. Wynette and Liam have another sister – who can’t be named because she’s underaged – who also misses her little brother. In the meantime, confidential sources have told YOU police have brought several people to see Nantes in prison in the hopes that he’ll divulge Liam’s whereabouts. But so far his lips are sealed. The only thing he allegedly left Cheinelle of her little boy was a scorched lock of Liam’s hair and a note saying she’d never see her son again. Mokgoro Report: When will Ramaphosa act?